The Farm feature can be accessed from the player's interface after reaching level 30. When players are in their Farm they can start planting crops, after a crop is planted there will be a timer for it. Once the timer is finished players can harvest it. Players can even steal crops from other player's farms. 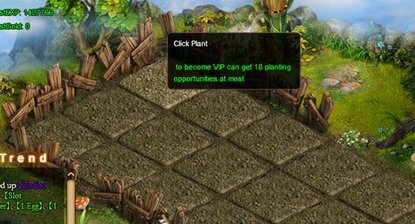 Players can accelerate the ripening of crops by clicking on them. Additional farm land can be unlocked every 10 levels by paying gold.